« What’s new at ITEC? 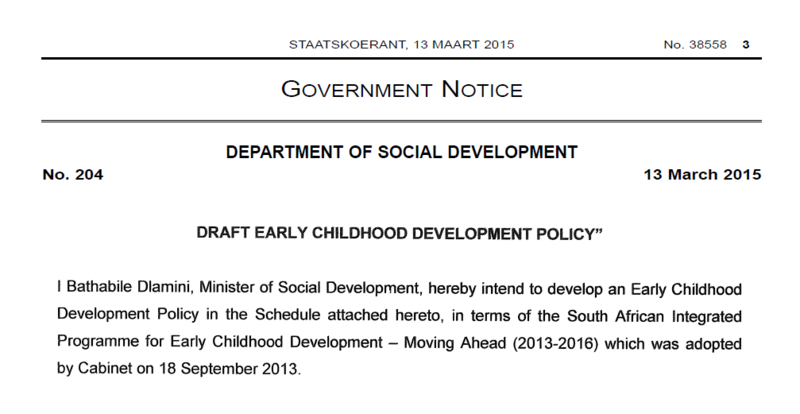 We have a unique opportunity to define the future of young children in South Africa by commenting on the Draft National Policy for Early Childhood Development. Comments are due by 24 April, 2015. This landmark policy document aims to ensure that all children in South Africa, especially the most vulnerable, have access to the services and programmes they need to develop to their full potential. Not only is this a children’s rights issue, but is also deeply important for the future of our society as a whole. The evidence is increasingly clear that children’s life trajectories are set during the earliest years of their lives. Children who are well nourished, who are loved and well cared for, and who have rich opportunities to learn, are more likely to be happy, successful, and healthy adults. Click on the link to read or download the Draft Policy. If you would like to comment directly to government (by 24 April), please use the prescribed Comment Format. If you would like to add your voice to a broader collective, please contact Michele Kay at 043 7438333, or email mail@iteced.co.za.